Brian LeBlanc Writer of stuff. 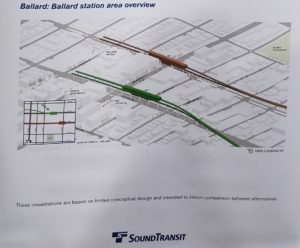 On Thursday, February 28th, my family and I attended the Open House about the West Seattle and Ballard Light Rail lines. 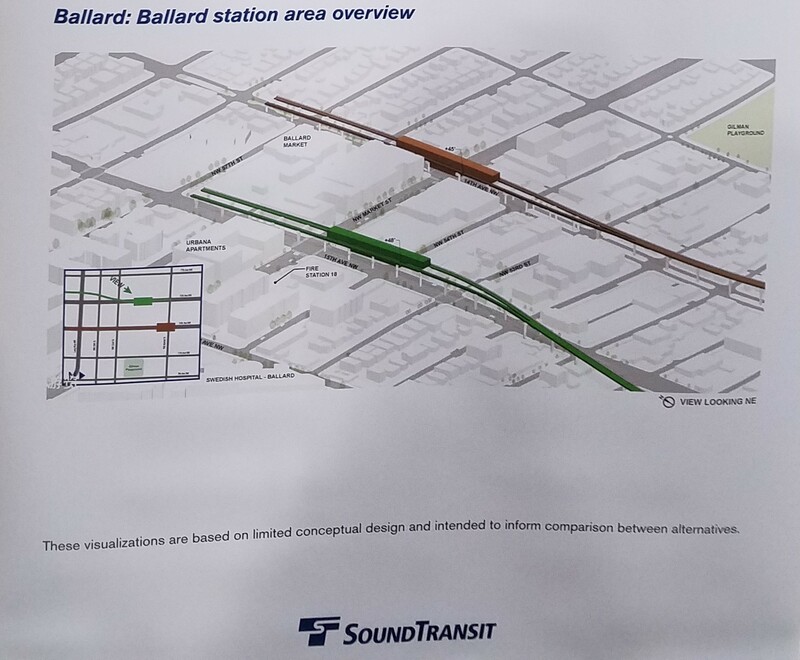 Sound Transit has completed three main design options for getting across the water as well as the Ballard station and is presenting them for public comment. There are three options: 1) a tunnel with an underground station on 15th Ave NW, 2) a tunnel with an underground station on 14th Ave NW, or 3) a fixed high (130’ or about as high as the Aurora Bridge) bridge over the Ship Canal and an elevated light rail station on 14th. From what we saw and the questions we asked about the station, two of these options are going to have a HUGE impact on 14th Ave NW. I am going to focus on sharing what we learned about the options, their impacts on 14th, and strongly urge you to investigate on your own and submit your comments before the end of the comment period which has been extended to April 2nd. The elevated station would be located at Market and 14th. The additional tracks past the station are referred to as “tail tracks” and would extend in between NW 57th and NW 58th on 14th. The columns will be 45’ high. The tail tracks are where the light rail cars would be switching or turning around. The engineer said that the light rail cars on the tail tracks would be going 5 MPH or less on that part and they would use the latest sound dampening technology. Even so, but they will still be noisy. In order to get over Salmon Bay and/ or the Ship Canal to Ballard, they are still actively considering 1) a fixed high (130’ or about as high as the Aurora Bridge) bridge over the Ship Canal on 14th, or 2) a tunnel underneath the Ship Canal with a station either on 14th or 15th. With the tunnel options I assume (but haven’t confirmed) that the stations would be underground, but the fixed bridge would end at an elevated station. Their current estimates are that the fixed bridge will cost $100M more, and the tunnel would cost $350M more. Of course, it will end up costing way more than that. Regardless of whether 14th or 15th is chosen, the engineer we talked to said that they are planning with the consideration of expanding service in the future to Crown Hill and beyond, which makes complete sense. We asked how the line would be extended if they build the elevated line on 14th. The engineer said they would probably have to make a tunnel at that point, and the entrance would be on 14th before Ballard High School. There might be a stop at NW 65th, but the convenience to the neighborhood would be offset by the noise created by the light rail entering and exiting the tunnel on 14th. In the sketches, the columns appear to be in the roadway on 14th. When I asked the engineer if 14th was still going to be open to vehicles, he said that was only a rendering and the placements could change depending on what they decide to do. He couldn’t confirm if 14th would still be open to vehicles, but that is still open to debate. The bottom line is, whichever option is chosen, it will have a massive and permanent impact on the area along 14th or 15th. If you want to get an idea of what an elevated station and support columns will look like, go visit 1st Ave NE from NE 92nd St. to the Northgate Mall. Take a look at the impact construction has had on that area. Imagine how much more infrastructure will be needed to create and support tracks with a sharp enough incline to ascend up to a 130’ tall bridge. Or a tunnel that goes to Crown Hill. The Sound Transit site with all the information on the project is available here. Personally, having a tunnel and underground station on 15th would be the least disruptive option for the neighborhood. I don’t think, however, that Sound Transit will subject 15th to this much construction. If they are going to have to build a tunnel in order to eventually extend the service, they will probably do it on 14th, and they might as well do it now. Having a bridge and elevated station on 14th that would eventually have to enter a tunnel before 65th would permanently destroy the neighborhood. I highly urge everyone to conduct your own research, decide which option you prefer, and submit your comments to Sound Transit before April 2nd. Please tell everyone that you know who would be affected by this. This is the opportunity to make your opinions known while they are in the early stages of conducting the Environmental Impact Statement (EIS). While it will be great to have light rail service in Ballard, the majority of the impact on the construction and the permanent infrastructure will be borne by the East Ballard neighborhood, and everyone who lives in the area should be aware of what this actually means. I am not quite sure that I understand your comments over against the drawings. The drawings show the line extending well beyond the Market Street station on 14th and yet you indicate that (at least for the time being) Market Street is the last stop on the line. Does it take two additional blocks to get the trains turned around or is the drawing simply a projection of the potential/eventual continuation to Crown Hill? Thanks for your comment. When it is completed , the Market Street station would be the end of the line for now. The additional two blocks worth of tracks would be for turning around the trains and are referred to as “tail tracks” in the documentation. The engineer we spoke to said that Sound Transit’s long-term plan would be to extend the line from Market Street to Crown Hill and beyond. I hope this helps- please let me know if you have any more questions. Thanks for posting this on your blog. I too attended the open house but only managed to make it after the presentations. Your added commentary was very helpful. I have lived on 14th for the past 22 years, have been involved with EBCA and the park from the beginning and am truly vested in the East Ballard community. Thank you. Thank you for the kind words. The situation regarding the specific impacts on 14th was not what most of the attendees of the open house were interested in. We had to ask very specific questions of an engineer and a property acquisition manager to wrap our heads around how disruptive this might be. I will keep investigating and let everyone know what I discover. Thanks Brian, the Magnolia Community Council has been strong advocates to save money on the new light rail by running on grade along the West side of the freight and Amtrak track. That savings will help to offset the difference between a tunnel verses a 12-story tall bridge over the canal. Thanks for letting me know about the efforts of the Magnolia Community Council. I have been focusing on the impact on 14th but I need to take a step back and look at the larger picture. Running at grade along the tracks in Interbay/Magnolia makes way more sense. Perhaps I’ve been on Mars, but I knew nothing about these proposals. Thank you, Brian, for bringing the matter to my attention. Perhaps there are others out there as clueless as I am; let’s hope not. I live on 60th, just west of the new park on 14th. For those who walk the neighborhood, my place is the one with the garden on the parking strip and the wooden fish on the gate. At any rate, a tremendous amount of community effort went into the creation of Gemenskap Park. Am I to understand that Sound Transit is considering eventually either burrowing under or building above the new park? That simply can’t be right. Will there be a community meeting here in Ballard to discuss this? I’m glad that I was able to bring this to your attention. I know that the neighbors around 14th Ave NW were planning to distribute flyers this weekend. The more comments the better! Moving forward there might be a more focused effort to organize people/have a meeting, but right now people are just discovering what is being proposed and the impact it might have. If I find out anything more, I’ll let you know. 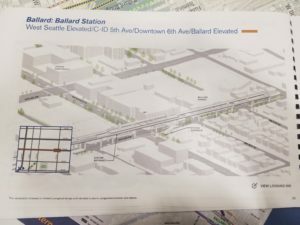 1 Pings/Trackbacks for "Light Rail Plans and the Possible Impacts on East Ballard"